The Italian Tourism Co – Sudan was founded by the Italians Maurizio Levi and Elena Valdata in the year 2000. They travelled extensively for over 20 year to Sudan, falling in love with the country and its people. As a Sudanese registered inbound agency, the Italian Tourism Co welcomes international travellers from all over the world and it promotes the country of Sudan as a very interesting cultural and archaeological touristic destination. the Meroe Tented Camp overlooking the Pyramids of Meroe and the Nubian Rest House in Karima, at the foot of the holy mountain Jebel Barkal. To work and live in Africa cannot be just business, it is a good opportunity to help people less fortunate than ourselves. Health care, education and many other things that we take for granted in Western countries are still a big challenge in Sudan. The whole team of the Italian Tourism Co has been involved for a long time in supporting local projects aimed to improve the lifestyle of some local communities. Amongst the last achievements we bought a new water pump we for the Bagarwjia village (near Meroe) with part of the income of the event “Mozart in the Desert”, a Venetian Quintet concert we organized in the amazing setting of the Royal Necropolis of Meroe. 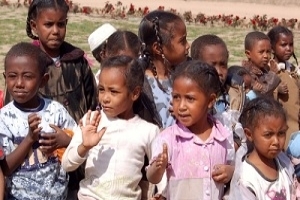 • There is the urgent need of enlarging and improving the small school complex use d by 3 little villages located just a few kilometres away from the famous archaeological site of Meroe (Al Tarabil, Assoura, El Salmab). At present, 120 children attend this primary school, between the age of 8 and 11 years old, divided into 3 classrooms. Needless to say that the rooms are not large enough for such a large number of children. The school building itself is also quite structurally unsafe and unpleasant to reside in - there are no windows, the roof is incomplete and there are no toilets! There is a new project of adding extra schoolrooms, buying furniture - some of it basic, to allow this school to work properly or at least better. We strongly believe that education is the key factor to ensure that young generations will have a better future. We can’t change the past but we can change the future. • Local traditions are a big part of the cultural heritage of a country; the Italian Tourism Co Sudan is trying to help local communities in this matter. In the Nubian villages, as an example, people used to paint the houses walls with flower patterns and geometrical design, but with the increase of the costs, people cannot afford to buy the colored paints anymore. We are, therefore, on our travels bringing some paintings we buy ourselves from Khartoum to the villages to help them maintain their important traditions which, in turn, also helps in attracting travellers to this specific region. To be able to achieve the goals we are aiming for, The Italian Tourism Co. will be the local operation team for the new NGO – FRIENDS OF SUDAN recently registered in Italy by Maurizio Levi, Elena Valdata, Valentina Rubbi and Carla Piazza. Friendship is the value that pushes us to find time, strength and money to achieve our goals. Guests, whilst travelling with us in Sudan, will be visiting the school in Bagarwjia and will receive first hand information and updates directly from the people who are developing these projects. Everyone is welcome to support, in any way possible, our commitment to “Friends of Sudan”. ������ ����� �������: ��ѡ ������� ������ .